It will be the first and possibly only time in history that will cross the confines of Vatican City. And they do so to be welcomed and exposed in the beautiful halls of the Capitoline museums in Rome. It is original and 100 documents chosen among the priceless treasures that the Vatican Secret Archives preserve and protect for centuries. The exhibition organized on the occasion of the fourth centenary from the foundation of the Vatican Secret Archives to explain and tell what is and how does the Archive of the Popes and, at the same time, make the invisible visible and allow access to some wonders so far kept in approximately 85 km linear shelves of the Vatican Secret Archives; will be exhibited extraordinary historical value documents, covering a time span ranging from the 8th century AD until the 20th century. The title “Lux in arcana” communicates the main objective of the exhibition: the light that filters into the recesses of the archive illuminates a reality out of a superficial knowledge, but accessible only through direct contact and concrete with sources, which for the first time opens its doors to discover the history, sometimes unpublished, narrated in the documents. The exhibition will be enriched with multimedia productions, led by a strict as engaging historical narrative, to allow the visitor to enjoy some famous events of the past and “revive” documents, which you will with the tale of the background and the characters involved. The document-chosen from among 100 codes and scrolls, files and records and manuscripts-will remain on display for about seven months, from March 1 to September 2012, at the Capitoline museums. A prestigious venue, chosen to host this memorable event that underscores the deep connection between the city of Rome and the papacy since the medieval age; the sensitivity for the arts of Sixtus IV bind the origins of both institutions involved in the event, but at the same time the history kept in the Vatican Secret Archives is intertwined with the history of Italy, Europe and the whole world. The Vatican Secret Archives constitutes a cultural heritage that has as its epicenter the city of Rome. That is why the exhibition was organized in collaboration with the capital Rome, Department of Policies and Culture, Historical Center – Superitendence of Cultural Heritage of Rome and Zètema Culture Project. This memorable exhibition is already creating a huge expectation, nourished by the mysterious charm that the Vatican Secret Archives raises in the collective imagination. 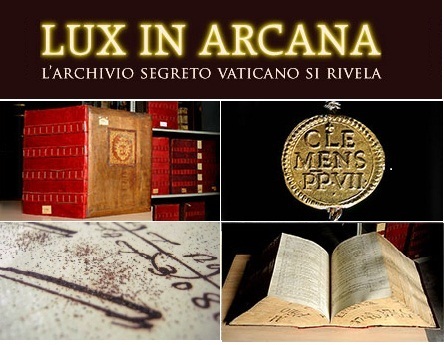 All this will do Lux arcana-in the Vatican Secret Archives revealed a scientific value and unprecedented media.